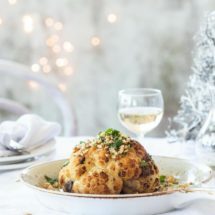 ‘Can you think of a dish to serve for Christmas that would make both my vegan friends as well as my meat loving friends happy?’ Such was the question I received by mail from one of the readers of my newsletter. A vegan main. Hmm, I could see why that would be a challenge. Let’s face it: in most cases the main of any Christmas dinner is centered around something meaty or fishy. The turkey’s, roasts or salmon is usually the centerpiece. I had seen a whole roasted cauliflower before and in fact we had tried it ourselves before but not filled. I still had a can of chestnut puree and I figured that would be great with cauliflower. I also want to keep it paleo and glutenfree so instead of opting for a bread crumb top, I made a top of chopped hazelnuts. Preparing the cauliflower can be a bit tricky. You have to cook it whole first after removing the core and that makes it slightly tricky to keep it together. Just remember that using the filling will stick it back together but make sure you handle it carefully. Remove the leaves from the cauliflower. 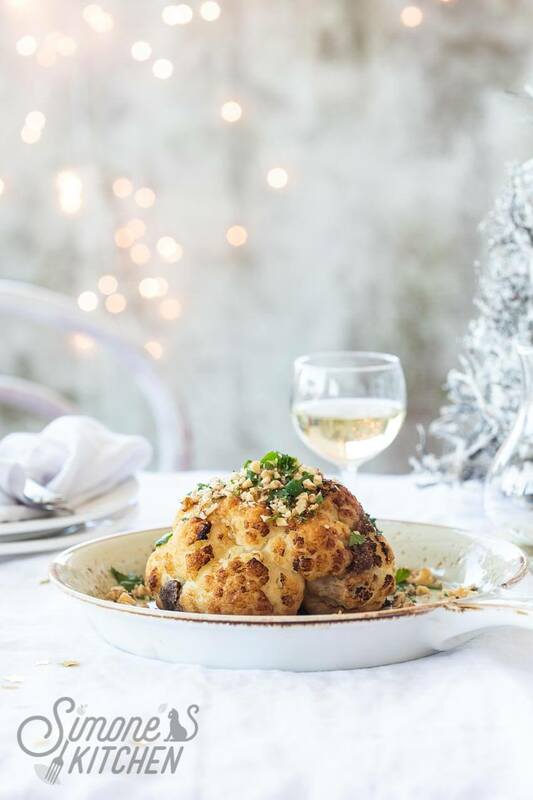 Turn the cauliflower on it's head and carefully remove the stem but make sure all florets still stick together. Take a large pot of water with salt and bring to the boil (it needs to fit the complete cauliflower) and place the cauliflower in it. Cook for about 7 minutes. Remove the cauliflower from the pot with two slotted spoons and set aside to steam dry. Place the chestnut puree, the onion chestnut mix and the walnuts in a food processor and turn until smooth. Add salt and pepper and nutmeg to taste. 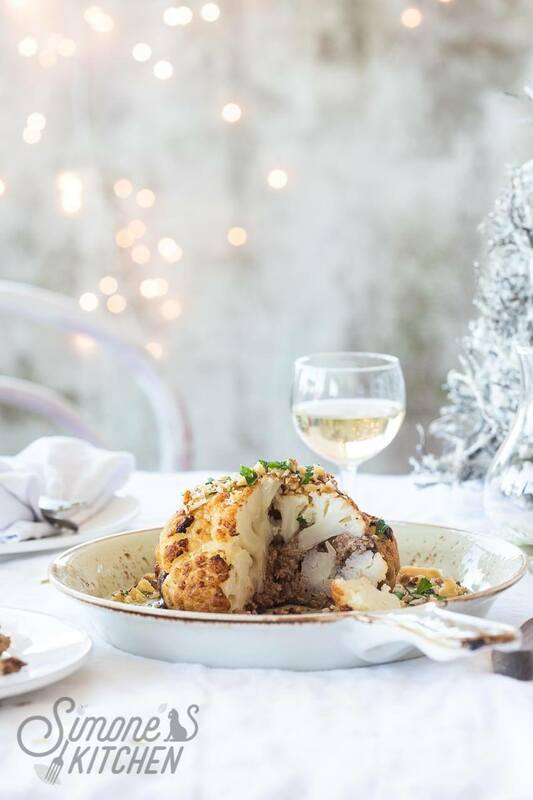 Place in a piping bag and start with filling the cauliflower. First place the cauliflower on it's head again and fill each nook and cranny. In between the florets, where the stem used to be and anywhere you can fit in some filling. Turn around again and place on a baking tray. If you still see holes, fill it with puree as well. Preheat the oven to 200˚C. Rub the top of the cauliflower with olive oi.. Place in the oven for about 45 minutes or until golden.